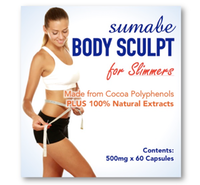 Sumabe® Body Sculpt for Slimmers is derived from Cocoa Poly-phenols to enhance body shape & form. Cocoa and chocolate are the richest dietary sources of polyphenols & in particular, the two procyanidins, catechin and epicatechin. The structure of procyanadins makes them powerful antioxidants. Research shows they have greater potency than antioxidant vitamins C and E.
Cocoa polyphenols have a protective effect on endo- thelial function & contain pro-cyanidinsepicatechin & catechin - exceptionally effective antioxidants. Adults, take 2 capsules with warm water immediately before breakfast, or as directed by your healthcare professional.